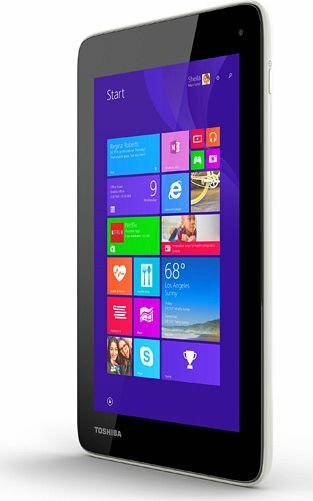 Even though $199 might seem like a good price for a budget Windows tablet, we find it hard to recommend this tablet simply because the screen — you know, the entry mechanism for a tablet — is so poor, offering a barely usable experience that can’t possibly make the case for owning a portable touchscreen computer. We’re stumped, we really are, because a tablet should be much better than this, and there is already solid competition in the budget Windows slate market. Positive: Compact size; full-featured 32-bit Windows 8.1; reasonable performance; low price. Negative: Poor camera; poor display colors. Model: Good things sometimes come in small sizes. The display on this tablet is only 7 inches. It is however, a multi touch screen with a 16:9 ratio and a resolution of 1024 x 600 pixels. The LCD screen density is a mid-range 170 ppi. 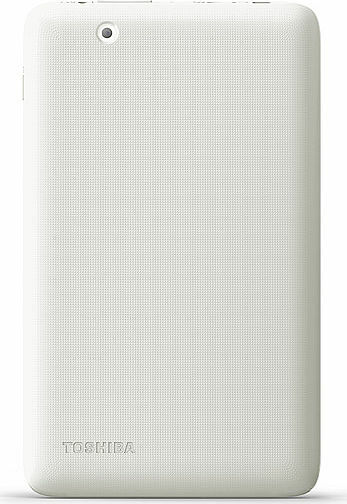 The back portion of this tablet is made of white textured plastic and the screen is framed by a 0.4 inch (1.02 cm) black border bezel. The entire tablet is 7.8 inches (19.81 cm) long, 4.7 inches (11.94 cm) wide and about 1.1 cm thick. It weighs an extremely light 354 g and the design is meant for easy usage with just one hand. As opposed to the numerous android tablets out there, the Toshiba Encore Mini runs on a Windows 8.1 OS. Windows offers a host of apps that enable the viewing of video and pictures, internet browsing and other daily tech functions. 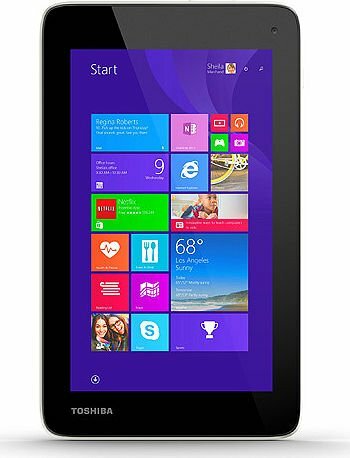 At the core of the tablet is a quad core Intel Atom processor for tablets with Intel Burst Technology 2.0 that can clock a speed of 1.33 GHz that can hit 1.83 GHz with burst technology. 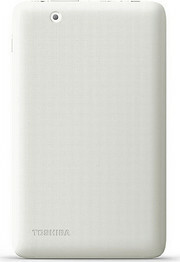 There is 16 GB built in memory and 1 GB DDR3L RAM that can clock up to 1.3 GHz and a micro-SD card slot. There are two cameras in the tablet, a 2 MP rear camera and a 0.3 MP front camera. 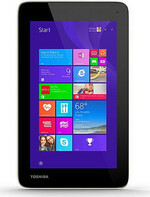 This tablet is within the extremely affordable range and will be attractive for those on a budget. 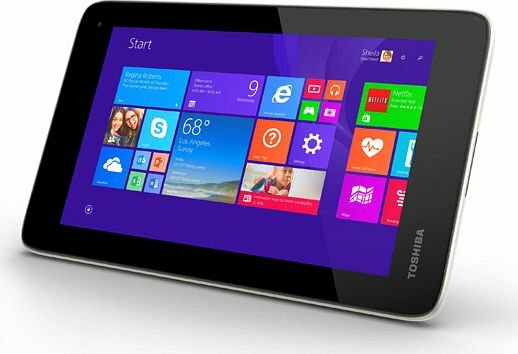 The Toshiba Encore is Toshiba's first 8 inch Windows tablet and it's priced to fit within tight budgets. 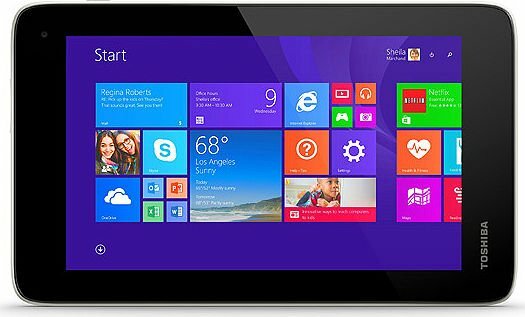 This device reportedly benefits from Toshiba working with Microsoft to ensure that the tablet is optimized to work with Windows 8.1. It was also designed to be optimal for Skype use with dual-array microphones and noise reduction. One attractive prospect is the free Office Home & Student 2013 that comes pre-installed. All these factors considered, along with the 8 MP camera and a good selection of ports mean that this device is versatile and can be used for a variety of business, productivity and entertainment uses. For those who find the 8 inch screen a bit too small for word processing, the micro HDMI port will allow users to hook this device up to an external monitor. 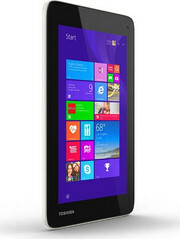 Powered by Intel's latest quad core Bay Trail Atom processor - on paper- this looks like a potentially great device. With a standard 1280 x 800 IPS multitouch display and 32GB of storage (which can be expanded with a microSD) there's nothing spectacularly different about this device when compared to other similar machines, other than the updated processor, but it is cheaper than most others. Weighing in at 0.48 kg, the 8 incher should work well for one handed use. The design is a low key affair in matte silver. 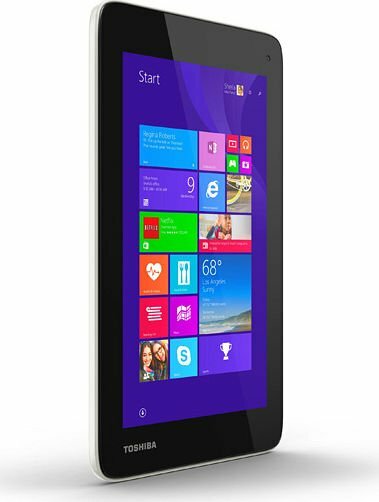 For those in the market for a pocket sized Windows 8.1 device, the Toshiba Encore could be the one to beat.